See Jane Sew: Butterick 5796 Maternity Top Complete! Butterick 5796: Pullover maternity knit tunic style top with side ruching. I made view E with no alterations. Size 8-16. After reading a couple of reviews here that said this runs on the large side, I cut a straight size 8. Yes. I was surprised, but it did. During the initial basting and try-on I was getting worried it would be too snug in the hip area, but it actually fits the belly and hip like a dream. Some reviewers have said it fits like a tent, but I didn't find this to be the case. For the most part these instructions were super easy to follow. I only got a bit confused about making the ties for the sides. For some reason I was stuck on thinking the description meant the cording for the side ties would stay inside. In reality, the instructions were meant for the cording to only be used to pull the ties right side out after stitching. Once I had this epiphany this top finished up easily. I liked how straightforward and easy this was to sew up. What I'm not liking now that I'm wearing it is how relaxed the shoulder seam is and how big the neckline is. I also am not a big fan of how the casings are made by clipping the sideseams half way up. I couldn't find a good way to finish off this top edge so there is a raw edge there at the top of the casing on the inside of the top. This is certainly not a dealbreaker, but it does go against my goal of creating insides that look very clean. 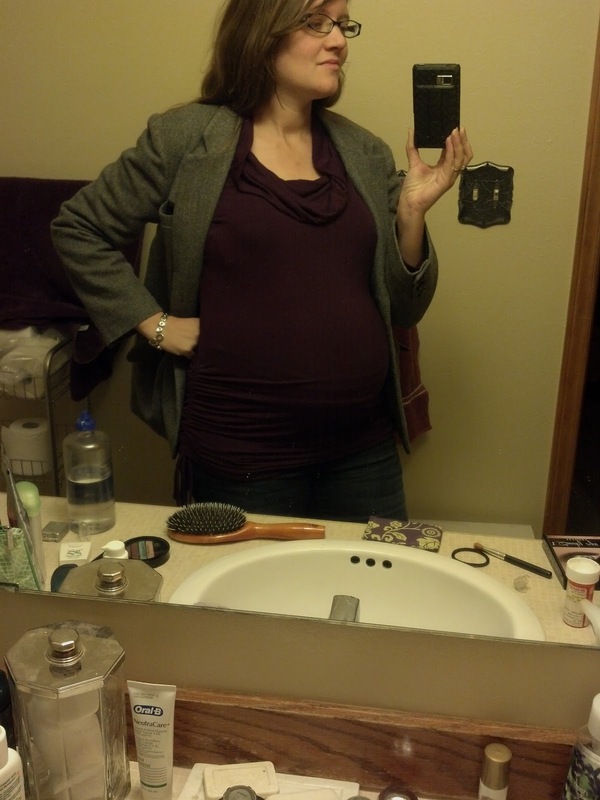 I used a rayon jersey knit in a dark plum that I found at JoAnn. Since I live in Central Oregon I don't have any good fabric stores to choose from. I bought this to use as a sort of wearable muslin before buying a nicer fabric to try. I'm still a bit shy when it comes to buying fabric online. I cut a straight size 8 with no alterations. I would likely sew this again and I'm already thinking about doing view B with longer sleeves. I think views C and D are hideous and I'll never make them. Even though I'm on the smaller bust side, who wants all that excess fabric across the bust? Yuck! I would definitely do a small shoulder adjustment on my next attempt. It's like this current pattern was drafted for a linebacker! I would recommend to anyone attempting this to cut out a size smaller than they would normally to avoid the "tent" effect. Being pregnant doesn't mean you want to look as big as a house, amirite? The pants are interesting and I'd like to try them as well, but I need a suitable fabric. My current local choices are JoAnn and Hancock. *Sigh* Gotta get up my courage and buy something online. This is a great maternity wardrobe builder that has lots of possibility for alterations. You could make a few of these tops in different styles and they'd definitely get you through trimesters 2 and 3. I'm currently entering trimester 3 and I think this top should carry me through to the end. Hopefully I'll be able to get to the pants and see how those work as well! Looks like you have the same fabric I got for a longer maternity tunic! I have some also in a green with which I'm making this shirt. Thanks for the tip about the ties. I think that I'd be faster sewing if it weren't for all these little weirdo differences between the pattern companies! Hi Kristin. Thanks for visiting my blog. I'm glad someone is reading. I've been so busy with the little one I've been behind on projects and posting. I'm hoping to fix that soon! Let me see if I can explain the collar: Once the get the pieces sewn together you fold it in half WRONG sides together to make a double layer. Then attach it to the collar makin g sure to line up your notches on the neckline and the cowl itself. You shouldn't have to do any stretching or easing to make it fit. The seam should be in the back. Then sew to the neckline with the cowl side on the outside. I hope that makes sense. I can provide more details and pictures if you'd like. You've inspired me to post more! Thank you! Thank you for the compliments! And that jacket is my favorite hand-made item ever. So well constructed. Thank you!